© 2012 by Amy Jackson; All rights reserved; content may not be copied, rewritten, or republished without authors written permission. 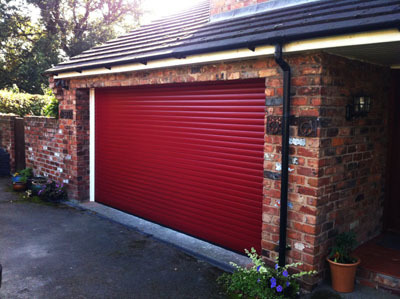 If you are looking for a reason to buy a roller garage door we will give you one. As a matter of fact we will give you five great reasons to think about before making your next purchase. Also keep this in mind — not only is there an aesthetic value to this type of garage door, but there is the practical side too. The number one reason these types of doors are popular is space. Since these doors roll up into a cylinder above the door, they leave a ton of space available for storage or oversized vehicles. If you compare this type to other electric garage door mechanisms, such as the ones that have a screw or chain drive attached to the roof, you will find that a roller door takes up less than one foot from the face of the garage entrance. These doors are built to last longer. This is due to the fact that there is less impact on the door when opening and closing. This also makes them safer to operate as compared to traditional style models where they can fall off their tracks, or accidentally crash down because of the weight when they are not properly installed. Not only does the roller mechanism require less maintenance, but almost anyone can manually lift or lower the door without much effort when required to do so without using the remote control. This specific feature is especially beneficial for seniors and women, since you dont have to be a bodybuilder to maneuver this door as the other kinds of big, bulky single hinged models can often require. For some people, the benefit of appearance is high on the list of reasons why to buy. A good looking garage door can make or break that first impression a visitor has when visiting your home. These doors are available in a variety of finishes; the nature and design of the door allow manufactures the freedom to offer buyers high quality finishes that will compliment almost any home. The secret is in the sectional construction. Some people would like their garage door behind the frame and others want the garage door to fit right into the frame; the choice is yours. In some cases you may not have a choice; no problem, as this type of door system will fit right where you need it. When switching or looking for new electric garage doors, put the roller door at the top of your list. You will pay a little more up front, but you will enjoy the beauty, safety, and longevity that comes along with owning this stylish garage door. If you have any positive or negative experience with a particular brand or model of door, please share it with our readers in the comment section below! This article was written by Amy Jackson. Her passion is to write on Home & Garden and Travel Blogs. She may be reached @eBizVenture. Do Rain Gutter Guards and Screens Work? Article © 2012 Amy Jackson; All rights reserved; content may not be copied, rewritten, or republished without authors written permission.